A Palestinian teenager has been shot dead in the Gaza Strip in what appeared to be a clash between Palestinian militants and local residents. 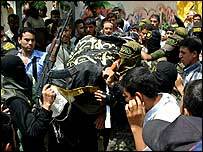 He died in the northern town of Beit Hanoun, where militants have often launched missile attacks on Israel. A BBC correspondent says militants may have been planning a rocket attack, which the residents opposed for fear of Israeli retaliation. Last month a missile fired from the area killed two people. Israeli troops moved in soon afterwards to try to prevent further attacks. They have demolished homes and orchards and blockaded residents for more than 3 weeks. The BBC's Gaza correspondent Alan Johnston says conditions in the town are difficult and dangerous. Meanwhile in Gaza City, funerals were held on Friday for two Palestinian militants killed by an Israeli missile strike on Thursday evening. The Islamic Jihad militant group identified them as its members and said one was a local field commander. The details of exactly what happened in Beit Hanoun are sketchy. Some witnesses said the young man was killed by militants whom he saw burying an anti-tank mine near his house on a track used by Israeli patrols. Other reports suggest he was shot by Israeli troops. Our correspondent reports there was an exchange of fire between the residents and the militants. Several people were injured. In the past, ordinary people in the town, which lies close to Gaza's border, have said they support efforts to confront Israel. But our correspondent says they have also made clear that they feel their town is being made to bear too heavy a burden - that militant action is causing them to suffer too much at the hands of the Israeli army.